On Thursday July 23, two sisters joined a group of family friends at a wedding meeting of their brother who is getting married on July 29, six days before Election Day, August 4. The meeting was held at an uptown motel in Kicukiro district of Kigali City. At the meeting, the sisters wore RPF caps and t-shirts. 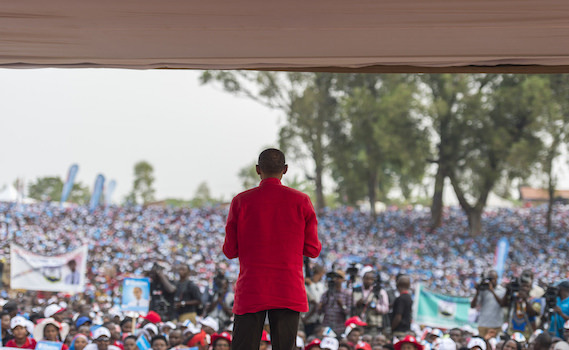 They had earlier been at an RPF rally in Nyarugenge district where President Paul Kagame had held a campaign rally. They drove to the meeting right after the event. The sisters looked tired and contributed no ideas to the meeting, but they were subtly jubilant. Qn: Why are you tired? Ans: I spent all my time singing and dancing. Qn: Why? Ans: Hey, I have to. It is jubilation, and I am proud I went there. Qn: So, you left work and went to the rally? Ans: Yes, it was a must. Qn: Why do you leave work to attend a rally when clearly Kagame is going to win the race? Ans: We go to show him support. We go in big numbers to prove to him that the support is real. We don’t want him to doubt. Yes, he needs us, but we also need him. We want him to see it. The two sisters are among the thousands of staunch RPF supporters who have defied their employers and kept trailing Kagame on his rallies. They meet thousands of other local supporters at every rally. Wherever Kagame holds a campaign rally, the earth shakes. Many businesses close doors. In Further venues from the capital Kigali, hotels fill up with an advance party. Kagame’s presence is hard to define. One word: A stampede. Allegations have been made about the huge number of supporters at the rallies. Critics suggest that most of the people at the rallies are coerced to attend. Taarifa has investigated the story. After the first rally in Ruhango and Nyanza district in the Southern Province where images of over 100,000 supporters circulated on the Internet and attracted the attention of the outside world. More images surfaced from Nyaruguru district in Western Rwanda, this time showing over 200,0000 supporters. The focus here is much directed to the incumbent, President Paul Kagame. We visited several districts on Kagame’s campaign itinerary and other candidates as well. In Kicukiro for example, two days before the rally, RPF representatives were seen and heard mobilizing party supporters. In Kabeza, Kagarama, Gikondo and other sectors of the district, the exercise was done in broad daylight. Some residents said the only inconveniencing aspect was the loud announcements on a moving track with a sound system. “Sometimes it is done late evening. Sometimes the music is very loud, but no one has ever come to my house asking me or forcing me to attend any event,” a resident of Gikondo who supports Frank Habineza told Taarifa. He preferred not to be mentioned. A colleague who was standing next to him interrupted him and said, “but you never say such things when garbage collectors are making announcements very early in the morning or at 8pm. Is this just because its elections?” he says. But the two continue bragging about how their candidate is better than the other. Our crew also visited Musanze, Gakenke, Rulindo, and Burera districts. The streets in these districts were decorated with cloths, banners and ribbons of RPF colours when we visited. “We are eagerly waiting for him,” says Therese Bamporiki, a businesswoman who owns carpentry in Gakenke district. Deep in the rural areas, local leaders and party representatives hold regular meeting where they discuss how to welcome their candidate and how the rally would look like. “Nyaruguru and Nyanza had many people at the rally, we have to show the same or more solidarity,” one of the representatives said to his colleagues after one of the meetings held at the multipurpose hall at the district headquarters. Taarifa spoke to people in Musanze district too. The district has a special bond with President Kagame and RPF. During the referendum voting in 2015 and previous presidential elections, Musanze district came among the top, with over 98%. Reason? They say they are rewarding President Kagame for having whipped out rebels that had wrecked havoc in this mountainous district of the northern province. In Rubavu district, bordering DRC in the north, supporters came in even bigger numbers so far; 300,000. Kagame has a strong foothold in this region for having stamped out FDLR insurgencies and DRC attacks for good and turning the district a touristic paradise. The masses that attended the rally on Wednesday were a clear testimony it is payback time with a vote. Kagame was expected to hold the rally these venues on Tuesday, but he canceled the trip to treat his voice. The cancellation did not cause any bile. Hotels say they remained full for the three days as supporters from other towns including Kigali waited for their candidate to show up. Our correspondent in Rubavu says hundreds of Congolese crossed the boarder from Goma to come and witness the rally. However, a week earlier, the Rubavu district mayor Jeremie Sinamenye dipped his hands in a cookie jar. Excitement to impress the RPF swept him and he ended up interfering with presidential candidates Frank Habineza and Philipe Mpayimana’s rallies. Police arrested him together with the Executive Secretary of Busanze sector of Nyaruguru district and charged them with interference in election campaigns. Investigations continue as the two speak to walls behind cold bars. Meanwhile, in President Kagame’s campaign rallies, supporters are served water and juice to quench their thirst under scorching sun. As the voting date nears, the momentum continues to build up. Reports in the western mainstream media branded these presidential election campaigns as a ‘climate of fear’ has turned out to be too peaceful and calm. Apart from two minor accidents one involving the Vice President of the RPF, Christopher Bazivamo, so far, no incidents have been reported. Rallies take place and supporters go back to their homes to rest after a long day of dancing and jubilating. At least this has been the same for all candidates. Had it not been for the peaceful nature of the campaigns, little would have been known about Frank Habineza’s unique and interesting dancing moves he has displayed at his rallies. Nevertheless, Rwandans have maintained extraordinary civility in the whole process. Only the voting day remains to prove otherwise.